In a sense, it could be true to say that ALL art is therapeutic. In a more distinct sense , therapeutic art can be said to be an expressive therapy that uses the creative process of making art to improve a person’s physical, mental, and emotional well-being. ​How Could This Benefit Me? The creative process involved in artistic expression can help people to reduce stress and improve self-esteem and awareness. 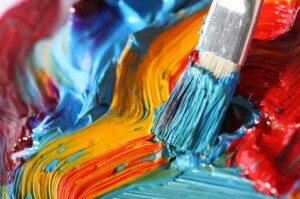 ​Anyone can do it and you do not need to be talented or an artist to reap the benefits. A Coach can work with you to question the underlying messages conveyed through your art, which can be a creative or healing process. ​It can be used in many area of speciality for counseling by therapists, healing, treatment, rehabilitation, psychotherapy, however, in the broad sense of the term and in the practice here, it can be used simply to express feelings and ideas, connect more deeply with your motivations and dreams , encourage relaxation and focus and provide enormous satisfaction from progress or simply from having created a piece of work. ​Do You Need To Be Talented At Art? Not at all. Everyone begins somewhere! If you wish to be technical about the process a good coach or teacher will assist you achieve your goals. Whether you want to study art as an end in itself or to release emotions or give form to hopes and plans, you need not be “afraid” of expressing yourself. The creative process can be most rewarding in itself. Supported by a good coach, you should begin to feel comfortable with this newfound form of expression. After all, the goal is to simply be yourself ! ​Involving yourself in an activity like drawing relaxes you. Your focus on your work may take you away completely from other worries or concerns although in many instances, feelings can be expressed in art which can help you interpret the feelings that pour into your design, and even help work through and resolve problems. Studies have also proven that colouring, even as an adult, has tremendous benefits. Colouring, drawing and painting has recently enjoyed a huge revival as a passtime for adults and the vast numbers of books containing designs to be completed and coloured are testimony to how much enjoyment so many derive from doing so. Why not try Art - maybe for the very first time and see how freeing it is to let your creativity flow! Catherine Hamilton Has been a professional Artist for thirty years and is happy to help you involve yourself in Art for it's own sake ~ a relaxing and satisfying pursuit ~ OR as a means of stress reduction, expression of concerns or the nurturing of hopes and aspirations.